The intermix of cycling, marriage, reflections of the past and the need to get back to the future. Today is better than yesterday. And, hopefully, not as good as tomorrow. I began to come to terms with things last night and didn’t find myself watching the alarm clock and wondering when I’d finally get to sleep. I think it helped that I could finally sleep on both of my sides last night, plus, frankly, it was a bit comforting hearing my wife’s snoring. How’s that for weird? It’s funny, after being married almost 40 years, the things you find endearing about your wife. The feeling’s definitely not mutual though; she can’t stand my snoring! My wife, about 6 months pregnant, back in 1987. On Facebook I tagged both her and Becky (in the tummy). I don’t have the ability to block the less-pleasant stuff. Or perhaps I don’t think such things should be blocked out, because I believe that where I am today is a product of everything I’ve done in my past. I believe we all are. Thankfully, in my nearly 40 years of marriage, I have nothing dark during that time to reflect upon. I especially enjoyed reading through the diary my wife wrote while pregnant with our first child, Becky. I had forgotten we had considered “Lindsay” as a name. (As long as I’m possibly embarrassing my kids, I should be fair and point out Kevin’s name was picked from the sports page of the SF Chronicle). 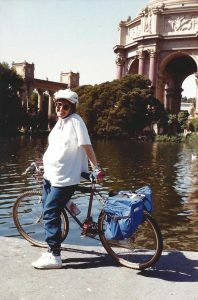 I also recognized what an amazing talent she has for writing; she pulls no punches and expresses herself in a way that makes you feel “you are there.” Like the way I try to write about bike rides, only I have to include photos, while she excels with words. And the way she writes about feelings, not just things, is beautiful. Being married has been a wonderful thing. Thank you Karen (wife), Becky (daughter) and Kevin (son) for that. Along with a few cats and many Corgis along the way. Anyone reading this might understand how much I need to get back on my bike. My life is about cycling, and who wants to read this personal drivel? Except that, I’m realizing now, that isn’t totally true. It’s more of an anchor that keeps me focused on the more-positive things in life. Once I’m back on the bike, I’m pretty sure a lot of my reflection upon the past will go away. I pray that my wife will put up with me until then. I think we’re both counting the days until I can get back on the bike. 12.